Kevin Merrigan at Northrop & Johnson tells me that there has been a further $1.25 million price reduction on Mr Terrible, now down to $22,700,000. Built by Delta Marine in 2007, Mr. Terrible is 36.94m in length, ABS classed and MCA compliant. Her interior by Adriel Rollins mixes Polynesian and Art Deco themes and won him the 2008 World Superyacht Awards Newcomer of the Year for its scope and detail. The yacht accommodates up to 12 guests in a master suite and four cabins. Twin 3650hp MTU engines give the yacht a top speed of 22 knots, a cruising speed of 18 knots and a range of 2,700 nautical miles at 14 knots. Mr. 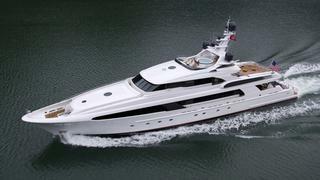 Terrible was featured in the 2008 edition of The Megayachts and also won an award for Best Semi-Displacement motor yacht over 40m at the 2008 World Superyacht Awards.